The Yahapalana government elected in 2015 is Sri Lanka’s very first puppet government. Analysts were quick to spot this. Lasanda Kurukulasuriya asked in 2015 ‘is Lanka being micro managed from afar. In 2016, the media said, ‘Yahapalana is acting on a preplanned scenario.’ ‘Government is following a foreign agenda.’ The public agreed. ‘Certain countries were exploring every possible political avenue, by hook or crook, to topple Mahinda Rajapaksa and to install a puppet regime to achieve their goals,’ said S. Akurugoda. Ranil was acting according to the dictates of the western masters, said Vasudeva Nanayakkara. If Yahapalana is a puppet government then who is pulling the strings? It is the United States of America, chorused analysts. The USA favors the creation of democratically elected puppet regimes, which will thereafter act on behalf of the USA, explained Tissa Vitarana. Sri Lanka will be a puppet of the USA like the Philippines, he added. Yahapalana government, is a ‘fully pro-Washington regime’, said Tamara Kunanayagam. The regime change of 2015 was to secure for USA, through a puppet Prime Minister, the strategic prize of Trincomalee, said Dayan Jayatileke. Tissa Vitarana stated that the Yahapalana conspiracy started in London with America and Delhi joining in. The people involved were Chandrika, Ranil and Mangala and they had worked on it for 18 months. This was reported by Ashok Mehta in Hindu in January 2015, said Vitarana. Maithripala was brought in, in the last two months. Sirisena will find that he cannot control the process, those forces are too powerful, observed Vitarana. The general election was held on 8th January 2015. The results were announced on 9th January at around 8 am and Sirisena was sworn in as President on the same day at 6.20 pm. This was therefore a very hurried swearing in. We saw on television, an uncertain Sirisena, guided along by Chandrika Kumaratunga. A few minutes after Sirisena took oaths as President, Ranil Wickremasinghe was installed as Prime Minister, despite the fact that there was a sitting Prime Minister. This was noted by the watching public and put aside for future use. We could not hear what Ranil Wickremasinghe was swearing to. The plan was that Sirisena would thereafter abolish the Presidency and hand over executive power to Ranil as Prime Minister. This was reported by Chandraprema as early as November 2015. In 2018, Rajiva Wijesinha confirmed this. While he was ‘heavily involved in preparation of the manifesto for the 2015 Presidential election’ he was told that it had been agreed that the presidency would be abolished and power transferred to the Prime Minister within a day if Maithripala Sirisena were elected. On 28TH April 2015 Parliament passed the 19th amendment to the Constitution. It was passed unanimously. According to the 19th amendment, the Prime Minister Ranil Wickremasinghe could not be removed and Parliament could not be dissolved for the next four and half years. The 19th amendment was brought in solely to keep Ranil Wickremasinghe as Prime Minister and keep the UNP government in place for the full period of five years. Recently, it was found that the clause saying ‘Parliament cannot be dissolved for 4 ½ years’ was not in the original draft sent to Supreme Court for clearance. It has been added on later. The UNP, utterly pro USA, held the ruling position in Parliament. Other key positions were given to the two political parties which were loyal to USA, namely, the TNA and JVP. The Speaker refused to recognize the ‘Joint Opposition’ which had over 50 SLFP MPs as the Opposition. Instead the position of Leader of the Opposition was given to R. Sampanthan of the TNA which had 16 MPs. The JVP which had six MPs was given the position of Chief Opposition Whip. The result was a Yahapalana Opposition as well as a Yahapalana government, said critics. The TNA which is the main ‘opposition party’, votes with the government and cooperates with it, inside and outside Parliament, hooted critics. R. Sampanthan, the Leader of the Opposition voted with the government at the 2016 Budget debate. This was the first time an opposition leader has voted in favor of an annual budget of any government in Sri Lanka, said critics. Sampanthan is making history as a unique Leader of Opposition, anxious to save the government from being ousted. The Tamil National Alliance is definitely anti Mahinda Rajapaksa .They will not support Mahinda Rajapaksa under any circumstances. A four-member TNA delegation led by its leader R. Sampanthan made this position clear to President Sirisena. The JVP which is a CIA outfit is working in tandem with the UNP and TNA. This was seen in Parliament when it assembled on November 14, 2018 after the interim court order. Sumanthiran wanted the standing orders suspended, the Speaker agreed and JVP then came in with a resolution against Mahinda Rajapaksa. The Yahapalana puppet government is wholeheartedly supported by the ‘minorities’, the Tamil, Muslims and the estate Tamils. This became clear In November 2018, when 13 Fundamental Rights petitions challenging the President’s decision to dissolve Parliament were filed in Supreme Court. These petitions had been filed through Tamil National Alliance leader R. Sampanthan, UNP General Secretary Kabir Hashim, JVP leader Anura Kumara Dissanayake, Sri Lanka Muslim Congress leader Rauf Hakeem, All Ceylon Makkal Congress Party leader Rishad Bathiudeen, Democratic People’s Front and Tamil Progressive Alliance leader Mano Ganeshan and five others. UN Under Secretary General for Political Affairs, Jeffrey Feltman, a former US Assistant Secretary of State arrived in Sri Lanka in 2018. Feltman is a neo-conservative hawk, who has been involved in breaking up sovereign states into ethnic enclaves. Within the UN, he is also responsible for a team working on arrangements promoting federalism as a response to ethnic minority grievances, said critics. The US recently admitted the release of millions of USD in support of projects in Sri Lanka, in response to a query raised through Freedom of Information Act. The report said USD 40 million had been released from Complex Crises Funds (CCF) in support of governance, rule of law and economic reform in Sri Lanka. The same report said Sri Lanka received CCF amounting to USD 13,589,951 in 2015. The Center for International Development (CID) of Harvard University took over economic planning. Executive Vice President of the Overseas Private Investment Corporation (OPIC) visited Sri Lanka in October 2018. OPIC is the U.S. government’s development finance institution. OPIC said it came to promote U.S. investment in the region and strengthen cooperation with regional allies. OPIC wanted American companies given the opportunity to compete for government tenders in Sri Lanka. OPIC also wanted to invest in Sri Lanka‘s ports. The US 7th fleet came visiting, and had training session with Sri Lanka navy. These joint operations and military exercises, where ships planes, ground forces and special ops take part, are actually practicing for war, said TIME. They are executing defined war plans. President Maithripala Sirisena on a visit to South Korea, in association with South Korean President Moon Jae-in, strongly condemned North Korea testing long-range ballistic missiles. Other western counties linked to the USA were also active. The ambassadors of UK, France, European Union, Germany, Netherland, Italy and Romania were present at a high level meeting chaired by Prime Minister Ranil Wickremasinghe to discuss the Code of Criminal Procedure Act, anti-terrorist legislation, extensive amendments to the Public Security Ordinance. Yahapalana government was given the deadly task of totally annihilating the sovereign state of Sri Lanka and its people. Yahapalana was expected to weaken the central government, weaken the economy and create a restless population so that the west could intervene. Yahapalana is also planning to shrink the Lankan state by selling the country’s lands and ports. Recently, a Gazette gave 8 acres of land in Colombo to a foreigner, added a critic. Yahapalana plans to sell off or give on long lease, swathes of this small island thereby effectively shrinking Sri Lanka as a sovereign state, confirmed Dayan. What remains of the shrinking State will be converted into a repressive State, said Tamara Kunanayagam. The first task of the puppet government was to deliver Trincomalee to USA. ‘Yahapalana plans to give Trincomalee as a military base to the USA,’ warned Vitarana. For the first time after British colonial rule, a foreign base is being established in Sri Lanka he said. We will become part of the chain of military bases, which has been established by the USA worldwide, patrolling the Indian Ocean for them at our expense. Trincomalee will be a beachhead in the Indo-US axis against China. A beach head is a position from which an attack can be launched. Yahapalana also plans to give a part of Sri Lanka to India. Prime Minister Ranil Wickremesinghe plans to create a Tamil Nadu-Trincomalee-Vavuniya axis, said Dayan Jayatilleke. He knows full well the implications of what he is planning. Ranil Wickremasinghe said at an election rally in Vavuniya in February 2018, ” the rapid development of neighboring Tamil Nadu, and the development of the Trincomalee area will empower the island’s North and East, including Vavuniya. Yahapalana plans to allow foreign companies, to buy land in the North-East, said Dayan. Indian and Tamil Nadu companies would buy land and this would create a de facto Tamil Eelam or a Greater Tamil Nadu. The North and East will be converted either into a separate state, or annexed to India. India’s border will shift from India into this island itself. India has launched a housing project in Trincomalee and is reconstructing the railway line from Talaimannar to Medawachchiya reported the media. India will also fund Palaly Airport, inaugurating direct air links from South India to Palaly and Batticaloa. On the 26 of October, 2018, President Sirisena removed Ranil Wickremasinghe and appointed Mahinda Rajapaksa as Prime Minister. The public who had yearned to see Ranil go and Rajapaksa come back, lit crackers and cheered. Ranil Wickremasinghe refused to accept his dismissal and stayed on in Temple Trees. He invited the ambassadors of EU, USA, India, Japan, Australia and Canada for a discussion at Temple Trees after he was deposed as Prime Minister. Then he wrote to the ambassadors of USA, UK, Germany France, Norway and Italy, on the letter head of the Prime Minister of Sri Lanka, saying that he sought their cooperation to protect Sri Lanka and its peace. He said, please consider the possibility of deploying UN Peacekeeping Force here, and let me know. A photo of this letter is available on Lankaweb (http://www.lankaweb.com/news/items/2018/10/31/call-for-ranil-to-be-indicted-for-high-treason) . It is of note that instead of seeking the support of his own people when removed as Premier, Ranil Wickremasinghe turned to his mostly Western friends and allies, said Tamara Kunanayagam. The intention was to agree on a narrative that helps legitimize external intervention, she said. This ‘crisis’ brought out into the open the countries which were loyal to USA. Several European countries came out in open support of Ranil Wickremasinghe .These countries had never complained about the Bond scam, or the postponing of elections. When Ranil Wickremasinghe was removed as Prime Minister they rushed in, said observers contemptuously. Canada issued a separate statement. “Canada is very concerned by the recent events in Sri Lanka and is closely monitoring the situation. A number of countries, including the United States, United Kingdom, European Union and several other European countries, Australia and India have expressed concern over the sudden transition of power by President sacking Prime Minister Ranil Wickremesinghe and appointing former president Mahinda Rajapaksa as the Prime Minister, concluded Canada. Australia said it is seriously concerned at reports that the opportunity for a confidence vote will be denied when Sri Lanka’s Parliament reconvenes. UK Parliament said that they recognize Ranil Wickremasinghe as Prime Minister. Ambassadors of EU, UK, Canada, and Germany had also met the Speaker and warned of the unfriendly situation the country could face over the unexpected transfer of political power. ’ There was also a comment that the crisis could lead to a “bloodbath” on the streets if Parliament does not hold a vote soon. The Speaker’s Office said that the Speaker had urged the delegation not to take action against Sri Lanka. Speaker told the media that he saw nothing wrong in meeting diplomats. USA which was so brash and confident in 2015 has turned cautious within Sri Lanka . The acting US Ambassador together with the Head of the Political Division in the embassy had met with Speaker. They said they were surprised at the developments and they were watching. In Washington, the spokesman for the Secretary of State was evasive when asked whether USA would take action on the coup. The spokesman replied that the United States believes the determination should be made in accordance with the Sri Lankan law and due process. But others were more extreme. Samantha Power, former US representative at the UN, said USA should suspend aid and impose sanctions. The US embassy was however, quietly working with the public. There was a meeting of trade union leaders and US Embassy’s Economic and Commercial Officer at the Colombo office of the Solidarity Centre, a US- based labor rights group. US Embassy officials had wanted to ascertain the view of the unions on the present crisis. After this meeting one trade union issued a statement saying the country was slipping into anarchy and urged the authorities to call a Parliamentary election. Japan is USA’s military front in Sri Lanka. Japan knows that the pro-USA puppet government will continue. Japan said it plans to further expand defence cooperation and exchanges with Sri Lanka. Japan’s activities will move from navy to the Army and Air Force. Sri Lanka is a maritime country located at a strategic point in the middle of the Indian Ocean sea lane. Therefore Sri Lanka is important for Japan to maintain and promote our foreign policy. Sri Lanka is important for smooth operations of the Japan – Self-Defence Forces (JSDF) since ships and aircraft of JSDF make frequent port calls in Sri Lanka. Kohona said there was no crisis. Mahinda Rajapaksa ‘s appointment as Prime Minister was a very popular one. Fire crackers exploded all over the country, including in Jaffna. there is little chance of a descent in to violence as anticipated by Jeffrey Feltman. Sri Lanka is the oldest democracy in Asia, the oldest country to enjoy universal adult franchise in Asia, a country that has faced elections on a regular basis and held its course . It is quite clear that there is a concerted intentional conspiracy to destabilize Sri Lanka, said Rohana Wasala. There is no coming back for this country if it goes through, observed Dayan Jayatilleke. Certainly, Sri Lanka is a resilient nation that has withstood challenges. But Sri Lanka will find that it will not be as easy to get rid of Yahapalana as it was voting it in. USA will not let a country go once it has got its claws into it. Look at Iran. Yahapalana Series One has ended. Await Yahapalana Series Two. It will not be arriving at a cinema close to you. It will arrive with a thud on your front doorstep. The Yahapalana government of 2015 has been described as a puppet government, dancing to the tune of America. USA has come into Sri Lanka very late, but it has been interested in Sri Lanka for a long time. USA was the natural successor to Britain, when Sri Lanka gained independence in 1948. USA was the world’s leading nation after World War II ended. (1939-1945). But Sri Lanka continued its link with Britain. Our legal appeals went to the Privy Council in London. USA however established a quiet presence in Sri Lanka. In the 1950s there was the magazine ‘Free World’ and the United States Information Centre. Althea Gibson, Martha Graham and Duke Wellington visited. .Sri Lanka‘s strategic location in the Indian Ocean was important to USA and US would have hoped to gain control of the island someday. The first three Prime Ministers, D.S, Dudley and Sir John were not a threat to the west, but SWRD Bandaranaike, with his tilt to China and Russia was seen as a threat . SWRD was promptly assassinated. Sirimavo Bandaranaike, also very independent minded, was to be assassinated as part of a coup. She survived. The JVP was started in her time. Things improved for USA when J. R. Jaywardene (‘Yankee Dickie’) became the next Prime Minister. He turned to the USA. He allowed the Voice of America to beam out from Sri Lanka and was planning to let USA bring its 7th Fleet into Trincomalee. America’s aircraft carrier USS Kitty Hawk, accompanied by other ships of the 7th fleet came to Colombo. JR also introduced the Open Economy. ‘The level of corruption in this country now will be unlike anything we have seen before’ commented Ralph Pieris. The Open Economy brought in foreign companies. They set up their factories on prime agricultural land. The Open economy also brought in foreign goods. They killed our fledgling SMEs. Inexpensive local pasta vanished, replaced by expensive, not so good foreign pasta which took just as long to cook. JR introduced Presidential rule to Sri Lanka. In 1978, he became Sri Lanka first Executive President, holding enormous powers, sans checks and balances. These powers were hidden all over the 1978 Constitution. The stage was set for dictatorial rule. The stage was also set for puppet rule. Sri Lanka’s strategic geopolitical position acquired a new importance with the rise of China. Sri Lanka is in a ‘super position’ though it is not a ‘super power’, observed analysts. Sri Lanka could not be ignored nor could it be antagonized. USA therefore decided to create a pliable Sri Lanka, with an accommodating government, set in place by regime change. USA has been doing this for years in other countries said analysts. The US routinely uses complaints of corruption and bad government, to bring about ‘regime change’. USA is now building partnerships where the other country provides the manpower and the money. USA no longer has the strength to wage wars by itself, simultaneously, all over the world. The motivating force behind the US foreign policy is not the America we see, said analysts, There is an invisible force, recently dubbed the ‘Deep state’, consisting of a small group of super rich persons, most of them Jewish, who control the elite banks and businesses of the world, and therefore also need to control the world economy. Politics is just one part of this game. This ‘Deep state’ came briefly into public view in the USA when Kennedy was assassinated in the 1960s. Political power in Sri Lanka moved from UNP hands to SLFP hands in the last decade of the 20th century .President Chandrika Kumaratunga was not a problem for USA but Mahinda Rajapaksa who became President in 2005 was seen as an obstacle to US plans. Rajapaksa was a strong leader who can elevate the nation to greater heights as seen with the progress in just four years amidst a war, observed Manisha Fernando. It is during Rajapaksa’s time that oil exploration was started. The emergence of a strong political leader with links to nations such as China and Russia, Cuba and Libya was not to the liking of the west, she said. Further Rajapaksa was not prepared to listen to America and do as America said. He had to go. The role played by the US embassy, since 2009, to bring Rajapaksa rule to an end is now in the public domain, especially after Wikileaks. The first US managed project in Sri Lanka was to stop Mahinda Rajapaksa from securing a second presidential term, at the 2010 January polls, said analysts. US put forward Sarath Fonseka as the rival candidate for the 2010 election. USA put together a coalition to support him. Thanks to Wiki Leaks, the entire world knows how US brought pressure on the Illankai Thamil Arasu Kadchi-led Tamil National Alliance (TNA) to throw its weight behind General Fonseka. But even before Wikileaks, US involvement was known. In 2010, Sunday Observer ran a headline, ‘west behind moves to regime change’. ‘There are individuals working as puppets to western big powers’ added the media. This US plan failed. Fonseka lost, Rajapaksa won. Fonseka lost because many Sri Lankans saw Fonseka as a tool of the US government and western interests, said one critic. They feared that if Fonseka came, there will be external interference in Sri Lanka on an unprecedented scale. We see a clear alignment of political forces here. Those who work for foreign masters are with Fonseka, while forces concerned about the long term interest of Sri Lanka re rallying solidly behind Rajapaksa, said the media. The US plan failed in 2010 but an almost identical project succeeded in January 2015, when Maitripala Sirisena, the ‘common candidate’, defeated Rajapaksa. The role of the US in the regime change of 2015 is now well known, Thanks to Wiki Leaks, confidential US diplomatic cables that dealt with US efforts to form a political grouping capable of defeating Rajapaksa, is in the public domain. The US played a critically important role in forming the coalition under the ‘swan’ symbol. However, US had to withdraw a project called ‘Election Support through Voter Education’, using local NGOs after the Sri Lanka government objected. The USA also succeeded in getting the ‘minorities’ to vote for Sirisena. The north and east voted for Fonseka and then Sirisena. Sirisena won on the minority vote. The US also put pressure on the SLMC to join a coalition, comprising the UNP, JVP, and TNA. The Sinhalese are now resentful of the power that the minority communities have displayed over the destiny of the Island, said Chandraprema. Opinion polls conducted in the five weeks prior to the election showed an overwhelming 80% of the electorate recognized the 2009 war victory and the peace it brought as a major benefit and gave the credit to Rajapaksa. About 36% of the voters also gave Rajapaksa credit for the mega development projects. Sirisena won the presidential election mainly on Tamil and Muslim votes. The Prime Minister’s media division reported that though Sirisena got about 80% of the vote from the north and east, a survey had shown that 33% of the people there had not even heard of Sirisena before. Sirisena won only 6 of 16 major districts apart from North, East and Nuwara Eliya districts. Gampaha was won only by a whisker. Puttalam win was only due to the Muslim vote there. Sirisena got around 75% of the Tamil and Muslims votes and about 65% of the Christian votes. Sirisena polled around 65 to 80% of the vote in the large urban centers of Colombo. Sirisena was not a popular choice. After the election the SLFP discovered ‘the deep visceral dislike that the SLFP voters at the village level had for Sirisena.’ Sirisena came from a family of successful rice millers in Polonnaruwa. His brother Dudley Sirisena established the Araliya group of companies in 1969. It first sold Araliya rice then expanded into real estate, tourism, automobile, construction, and engineering. The Sudu Araliya hotel, in Polonnaruwa, where I once stayed and a new five star hotel in Nuwara Eliya are his. Initially President Sirisena was happy to belong to Yahapalana. When the 1st anniversary of the Yahapalana government was celebrated at Matara on 19.8.16. TV camera showed President Sirisena turning round after his speech and seeking the approval of Mangala Samaraweera and Ranil Wickremasinghe. However, Yahapalana was not popular even at the start. At the 65th anniversary of the SLFP, in 2016 the audience sat with long faces. As soon as President Sirisena finished speaking, within minutes the audience had got up and left. This could be contrasted with the enthusiastic crows seen standing at Mahinda Rajapaksa gatherings and the Pada yathra. USA needed a political party that would readily perform the functions of a puppet government. The most suitable party was the UNP, under the present leadership. JR had turned the UNP firmly towards USA. Its potential leaders, Lalith Athulathmudali and Gamini Dissanayake, who could not be easily manipulated, were assassinated. President Premadasa was also assassinated. Ranil Wickremasinghe became Prime Minister in 1993 and head of the UNP in 1994. If not for the violent deaths of Lalith Athulathmudali, Gamini Dissanayake and Ranasinghe Premadasa, it is most unlikely that Wickremesinghe would have become the leader of the UNP and, consequently, the Prime Minister, said analysts. But Ranil Wickremasinghe has admirers. ‘Cassandra’ commented on the poise, calm and stature projected by Prime Minister Ranil Wickremesinghe. He sits there calm and unruffled both in appearance and stance, cried. Cassandra . The UNP was never a majority party in Sri Lanka. Therefore the puppet government needed a second party as back up. This was already in place. Janatha Vimukthi Peramuna emerged as an important component of the puppet government. JVP is a CIA venture set up in the 1970s during Sirimavo Bandaranaike government. It unleashed two armed uprisings against the ruling governments in 1971 and 1987. Because it killed twice, it is unlikely to emerge as a ruling party. Its role is to collect disgruntled votes that may otherwise go to the opposition. The JVP had been deeply involved in the both the 2010 and 2015 regime change projects sponsored by the US. Today it is associated with the UNP and is referred to as Rathu Ali . Even though the JVP masquerades as an opposition party, they are an integral part of the Yahapalana collective, observed analysts. JVP mounts light attacks on the government with the approval of Prime Minister Ranil Wickremesinghe. In the first days of the Yahapalana government, JVP cadres took over the functions of the police and raided various government and private premises searching for evidence of wrongdoing by the previous government. 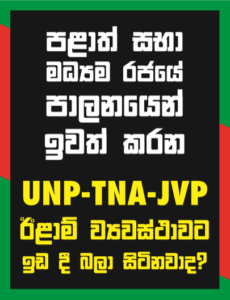 JVP has fully cooperated in every anti-democratic measure taken by the Yahapalana government. It was the JVP that provided the two thirds majority that the government needed to change the electoral system and avoid holding the Provincial Council elections. The JVP leader was a member of the Committee of ministers, politicians and NGO activists formed to oversee the work of the FCID. The Urgent Response Unit of the Anti-Corruption Committee was placed under the personal supervision of JVP leader Anura Kumara Dissanayake. Anura Kumara Dissanayake spoke at a function I attended in 2018. He said that Sri Lanka was poor and insignificant. We have no important resources, only a few minerals and graphite, but no gas or petroleum. This was intended to create low self esteem. The puppet government also has the support of the Tamil parties. While masquerading as opposition political parties, the JVP and the TNA have supported every anti-democratic action taken by Yahapalana government in the past three years, said Mahinda Rajapaksa The TNA and the JVP were included in the all-powerful National Executive Council which functioned over and above the Cabinet. When an Anti-Corruption Committee was formed under the leadership of the Prime Minister for the purpose of persecuting and jailing members of the previous government, the JVP and TNA were once again given prominent roles. Pohottuwa created world history when it became the first political party in a mature democracy with a well-established two party system to dislodge the two established political parties to become the largest political party. Pohottuwa attracted the full spectrum of Sri Lanka voters, rich and poor, town and village, English speaking and Sinhala speaking, westernized and non-westernized, without any encouragement at all. How it performs in the future remains to be seen, but one thing is sure. This Pohottuwa will eventually kill off the SLFP. That may be a good thing. The SLFP always had problems of image. Its leadership was radala, (SWRD, Sirimavo and Chandrika), but its membership was not. SLFPers were never quite sure what they were. They were not communist, they were not socialist, they were not capitalist, so what were they? They will be happy to leave the SLFP, but Pohottuwa must deliver. Yahapalana Phase One came to an end in a spectacular manner. In October 2018, President Sirisena removed Ranil Wickremasinghe from the office of Prime Minister and installed Mahinda Rajapaksa as Prime Minister. Ranil Wickremasinghe refused to go. He installed himself in Temple Trees and issued statements from there. Sirisena said he was getting rid of Ranil Wickremasinghe because Ranil was exceeding his limits. Ranil was running the country, arrogantly, the way he wanted. He ignored collective decisions, and made individual decisions. Ranil was ruining the country, Sirisena said and gave a long list of what Ranil had done wrong. Wickremesinghe and his group of close friends, described as a ‘samanala group’ conducted themselves as if shaping the future of the country was a fun game they played, said Sirisena. The committee set up by Ranil Wickremesinghe to manage the economy was totally fraudulent. The decisions made by that committee were fraudulent. It was a major challenge to abolish it, continued Sirisena. As an alternative to that committee, I established the National Economic Council. Wickremesinghe took steps to prevent the Commission from functioning. The monthly payment to its head was stopped by Ranil. Sirisena referred to the Land Ordinance Special Act , which was presented to the Cabinet in September 2018. If this was passed by the Cabinet and then by Parliament, all the land in Sri Lanka could be bought outright by foreigners. When I decided to visit the Central Bank and meet the staff of the Bank, Ranil Wickremasinghe suddenly came to my residence and asked me, The Central Bank belongs to me, why do you want to go there, continued Sirisena. The Commission on Bribery or Corruption and Attorney-General’s Department recommended amendments to the Bribery Act, to speed up the bond scam inquiry. We drafted the amendments to the Act at the Presidential Secretariat and sent to Parliament, but Parliament has postponed the approval of the Amendments Act indefinitely concluded Sirisena. An important feature in the Yahapalana puppet movement is the appearance of the Maha Sangha as an opposing force. The Yahapalana puppet government has a formidable opponent in the Maha sangha. I have never seen the Maha sangha so angry ever before. The Bhikshu Peramuna of 1956 was merely forceful, not angry. This time the sangha are very, very angry. They repeatedly called media conferences, where they ‘gave it tight’ to Yahapalana . The Maha Sangha, it must be pointed out, are citizens of Sri Lanka , with all rights and privileges enjoyed by citizens. They can vote at elections, speak at meetings and have the right to study and comment on political issues. The argument that the Maha sangha should only deal with Buddhist matters and keep quiet about everything else cannot be accepted. That argument has been concocted to silence the sangha. When the UNP went in delegation to Asgiri and Malvatu, they were listened to by a panel of monks, not the Mahanayake alone. Television news showed the monks trooping in. A group of nine monks held a press conference at SLFI, Colombo on November 3. 2018. This came on television news. Ven. Kadawara Gnanaratana said ,we support Mahinda Rajapaksa. He is rejected only by USA and European countries. The public also support Mahinda Rajapaksa. The Mahanayakes and sangha also support him. Ven. Kotapola Amarakeerthi said that Ranil was picking up from where the Portuguese and British had left off. Ven Hegoda Vipassi said ‘they are all the time talking of new Constitution, new Constitution . We say if necessary bring in amendments. This constitution is to create a federal state. President appointing Mahinda Rajapaksa was a timely, brave decision. Ven. Devalagama Dhammaratana, sangha nayake of Hambantota said Hambantota lands were to be taken over, they had already measured them.. About 100 temples and their lands were included in this takeover. Television news regularly carried interviews with the sangha. Here is a selection of utterances..’The public do not want Yahapalana, Licchavi, Wifi or Laptop. They want food’, said Ven Nitiyawela Palitha of the Sri Lanka Maha Bodhi Sangamaya, bluntly. The 2015 election was the result of a conspiracy, said Ven. Medagoda Abhayatissa. Foreign countries were interfering with Sri Lanka said Elle Gunawansa and Elle Medhananda. Western countries have penetrated deeply into our government, they control the Speaker and Ranil. They have brought in money and given bribes to MPs, said Elle Gunawansa. The government is unpopular, nava rajayak bihiwewa, said Ven Kirimbaruwe Gunananda. ‘. We need a person who can save the country. We must support Mahinda Rajapaksa’, said Ven Kumbalwela Upatissa . Ven Kollupitiye Mahinda of Kelaniya temple, made a long speech which was televised. He said our culture and our nations is under siege. He had voted for Yahapalana at the last election and regretted it. He now supports Mahinda Rajapaksa . Ven. Bellanwila Dharmaratana criticized Ranil Wickremasinghe by name, saying he had promised ten things to the TNA. Medagama Dhammananda and Medagoda Abhayatissa criticized the JVP. The real image of the JVP has now emerged they said. JVP had said that it was only after a society had completely rotted that socialism could come in. All that will be left then will be the worms, the monk remarked, contemptuously. Yahapalana wants to reduce this country to dust, they added. The monks spoke very disparagingly of the NGOs, calling them ‘NGO karayo’ .Ven. Vendaruwe Upali said ‘now it is NGO’s voice that is important, not ours. Also the voices of India, America, and UN HRC. This is very dangerous’. Jathika Niyojitha Maha Sangha Samuluva spoke out against the 20th amendment, saying that it was a device to create a federal state not abolish the presidency. Tri nikaya Maha Sangaratane had issued a 16 point statement against it. The Yahapalana puppet government has come as a rude shock to a complacent Sri Lanka . It has been a wakeup call. There is now a call for a ‘strong leader’. Until now Sri Lanka never wanted a strong leader, they wanted a leader they could push around. The Anunayake of Asgiriya Chapter Ven. Wendaruwe Upali said that a Hitler type of person was needed in Sri Lanka today. Susirith Mendis pointed out that the Anunayake was not talking of Nazi Germany and Auschwitz. He was voicing the public demand for a strong effective leader to save Sri Lanka and Buddhism. ‘Rata godaganna ekadipathi palanayak ona’, said a critic. ‘ Pavula godanagana palanayak neve, rata godanagana palanayak’. (Derana news 24.10.18) Ella Gunawansa advised, ‘next time, use your brain and vote not for party but for a person who can get us out of this mess. This is our last chance. This unpopular puppet government is scared of elections. Yahapalana delayed the local government elections, postponed the Provincial Council Election and now are trying to stop a general election Several Yahapalana MP have gone to Supreme Court on a Fundamental Rights application to stop Parliament being dissolved and a general election called. However, the country wants a general election. They want this puppet government out. Prof. S.Ratnajeevan H. Hoole, a member of the Election commission filed a Fundamental Rights petition seeking an Interim Order restraining the Elections Commission from proceeding to take any steps to conduct the Parliamentary election upon the virtue of the proclamation issued by President. He believes that the order to conduct elections is illegal and therefore the Commission should not proceed with conducting the Parliamentary Election. It was observed that Hoole, a member of the Election Commission was actually objecting to the holding of an election. This essay ends with a review of the opinions expressed after the performance in Parliament on 16.11.18, when the Speaker arrived escorted by police, with Ranil Wickremasinghe arriving just before, like a Peramuna rala, to get a vote of no confidence against Mahinda Rajapaksa passed. Kelaniya Raja Maha Viharadhipathi Ven. Prof. Kollupitiye Mahinda blamed the Speaker for what happened. Ven. Yatamalagala Sumanasara , the Executive Director of Daham Handa Centre, Pattivila, said it was necessary to carefully study the reasons behind the current situation in Parliament. The only solution is to call for a General Election. There is no other solution,” he said.. But Yahapalana is not prepared to go that easily. They hope that outsiders will come in and protect them. Global Tamil Forum (GTF)wanted the international community to come in. CAFFE said the intervention of a third party is needed to solve the conflict in Parliament there could be bloodshed and the loss of life if a third party does not intervene and help resolve the conflict between the top politicians in Parliament. The third party was not named. The ethnic basis on which the puppet government rests was made clear. Leader of All Ceylon Makkal Congress, Rishad Bathiudeen hailed Speaker Karu Jayasuriya for his courageous stand against anti-democratic forces. A broad spectrum of small but significant political parties representing different community interests and political philosophies – such as the Tamil National Alliance, Tamil Progressive Alliance, Sri Lanka Muslim Congress, All Ceylon Makalu Congress, Janatha Vimukthi Peramuna and Jathika Hela Urumaya – all of which have remained strong and uncorrupted, are potentially a ‘block’ in the making that could collectively promote constitutional democracy said Global Tamil Forum. Global Tamil Forum accused President Sirisena of illegal transfer of power from a sitting Prime Minister, proroguing the Parliament without consulting the Speaker and dissolving Parliament without any legitimate explanation. Sri Lanka has been a quasi-democracy where the Tamils were oppressed. S Akurugoda had a different view. The entire Sri Lankan community is aware of what has happened in the parliament on that date, which lasted only half an hour. The Country’s President had no other alternative but to reject the so-called ‘No Confidence Motion’ which was said to have been passed by the Parliament, since the entire act of the Speaker was against the normal parliamentary procedures when taking up such issues. It is also interesting to note how the champions of global democracy, who define ‘democracy’ and pretend to show that they are the owners of ‘’democracy’ of the world, are satisfied and praising such illegal parliamentary actions said S Akurugoda. With the emergence of open economy policy and foreign policy of the government elected in 1977, various forms of foreign interference including various meddlesome NGO started emerging’. Foreign interference, both political and economic, with the internal affairs of Sri Lanka was minimal prior to 1977. After 1977 there arose the undue interference of the foreign diplomatic corps based in Colombo notably US, France, Germany and Britain as never seen before. Foreign diplomats in Colombo, notably US held secret visits to discuss ‘undisclosed’ matters concerning the internal affairs of Sri Lanka. these countries didn’t utter a single word against the undemocratic, unconstitutional and mega level corruption issues which took place under the Yahapalana government they installed, but started to complain soon after the removal of Ranil Wickremasinghe, said Akurugoda. Some argue that Sri Lanka is now in an utter state of chaos. Parliament has become rowdy, administration is at a standstill, and businesses are moving out. All because President Sirisena acted wrongly in removing Ranil Wickremasinghe from the post of Prime Minister. That is not so. President Sirisena has given his reasons for removing Ranil Wickremasinghe and has now stated firmly that he will not reappoint him. This was of course obvious to everybody except those who were relying on Ranil Wickremasinghe to gain their objectives. TNA’s Sampanthan had pleaded with Sirisena, ‘please don’t do that Sir,’ and UNP MPs said ‘give Ranil Wickremasinghe another chance.’ (Sunday Times 18.11.18 p 15). President Sirisena has made a smooth transfer of power in accordance with the Constitution .He removed one Prime Minister and cabinet and substituted another Prime Minister and cabinet ensuring that there was no break in government. Ranil Wickremasinghe as the sitting Prime Minister had an obligation to go to Supreme Court to contest the matter, if the appointment was illegal, He did not do so. President Sirisena then dissolved Parliament and called for elections. The date for the next general election was announced. President Sirisena‘s action were welcomed by the public but not by the USA supported puppet government. Yahapalana went to courts to stop the dissolution of Parliament. The present uncertain situation is a direct result of this. Yahapalana alone is responsible. Something else is under attack here, the inalienable rights of the citizens of Sri Lanka. Clause 3 states In the Republic of Sri Lanka sovereignty is in the People and is inalienable. Sovereignty includes the powers of government, fundamental rights and the franchise.” Clause 3/4/e then elaborates, The franchise shall be exercisable at the election of the members of Parliament”. Clause 70/1 is a violation of this primary clause, which is also a guiding principle of the Constitution. I do not think any other constitution in the world has a crippling clause such as 70/1.